We have been hot after cabbage roses this year as they are quite the rage. I must admit they are worth the pursuit. 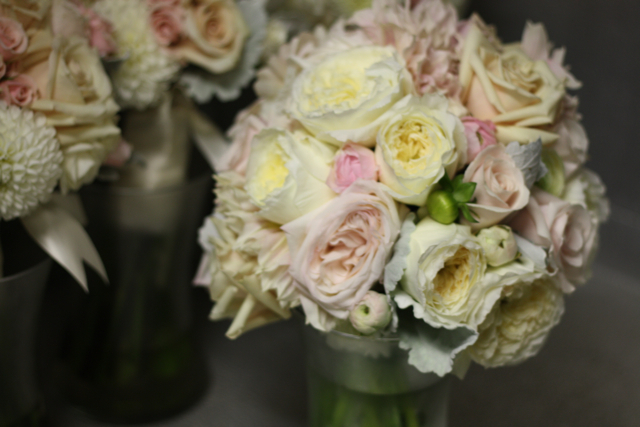 The cabbage rose is two or three times the size of a regular rose and they are the highlight of all of our designs. 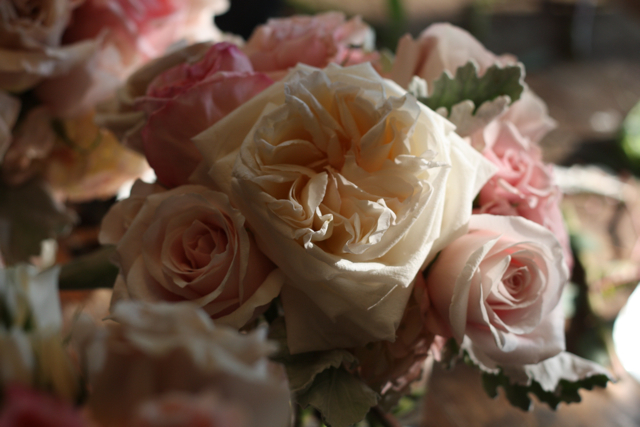 The above picture shows a cabbage rose mixed with some of the regular variety roses. Superstar, right? I have gone through thousands of these roses this year and each time they arrive safely I do the happy dance. We have taken to picking up a good bit of our roses at the airport, as this has opened up so many opportunities for us. 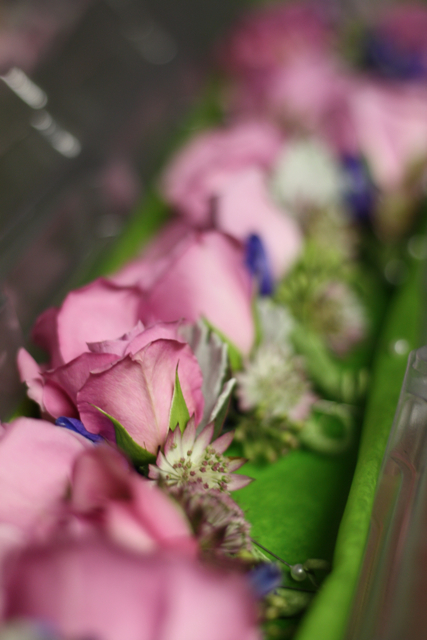 We purchase from five or six wholesalers each week to get out brides their promised petals. 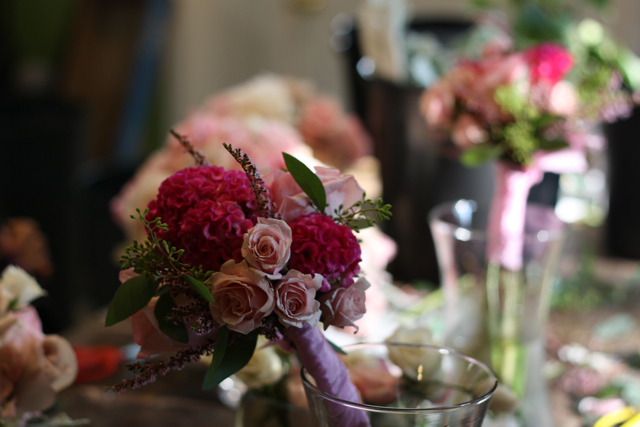 These bouquets feature pink ohara cabbage roses, pink and wine toned coxcomb and calcynia heather. 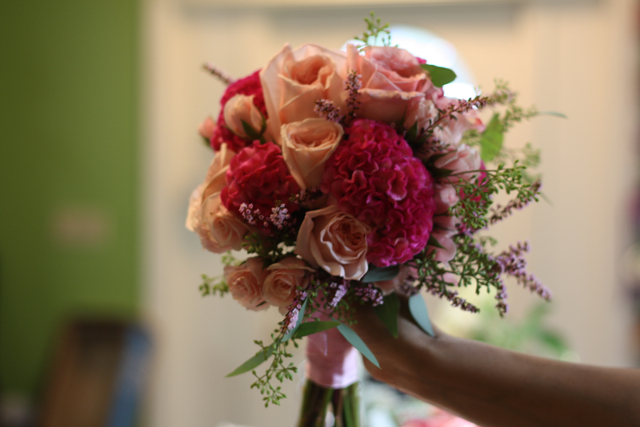 Local green hydrangea, Don’s dahlias and celosia from my garden were added to the bridal bouquet. 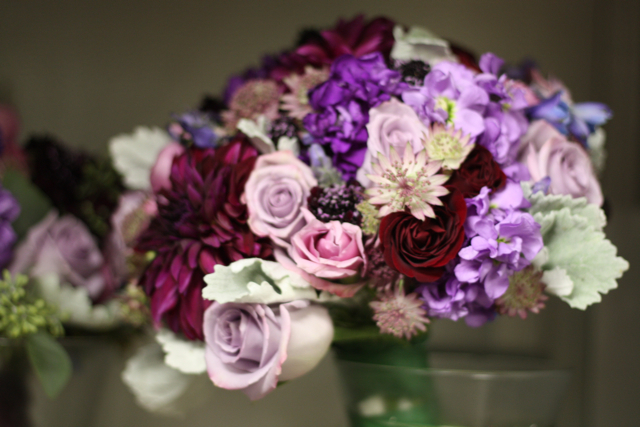 One of our brides will be carrying a mix of blues, lavenders, purples and burgundy. 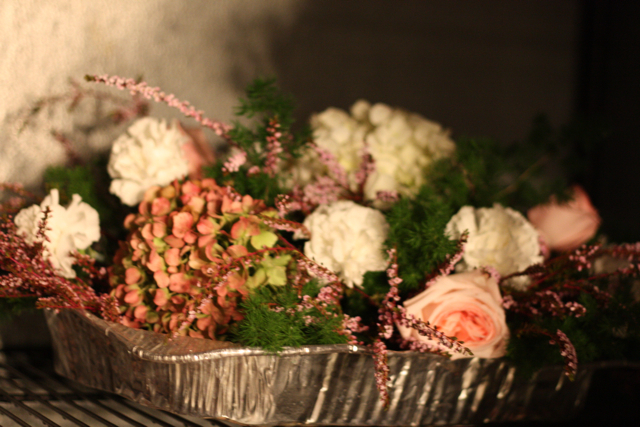 These flowers are very special as this is the second wedding I have down for this family. 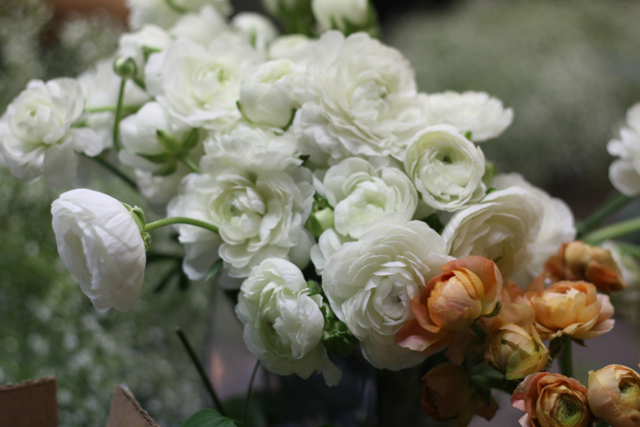 Thankfully, we are continuing to get wonderful ranunculus; we typically are unable to get this bloom in the extreme heat of summer. 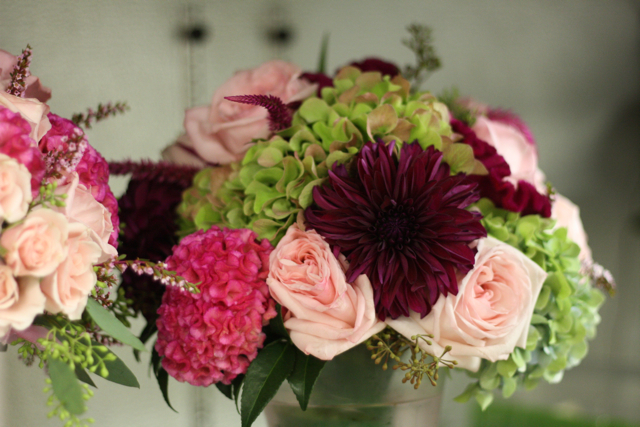 Little designs were created with spray roses, seeded euc, dusty miller and dahlias–these were created for the cocktail hour. 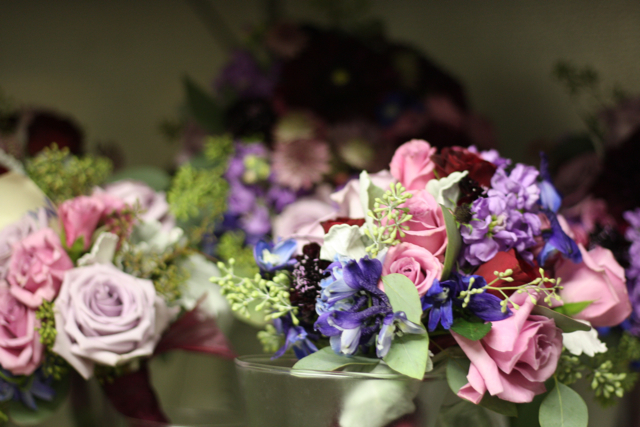 These bouquets are headed to Maryland and we are very excited about this wedding. 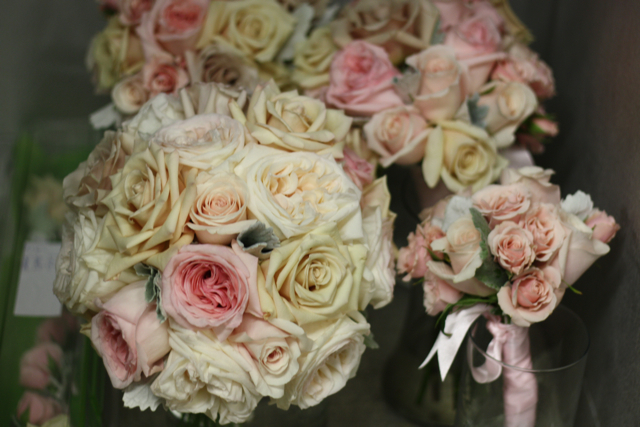 Luckily for us, we have two brides who were in the blush pink and cream mode. This only meant more cabbage roses for us. 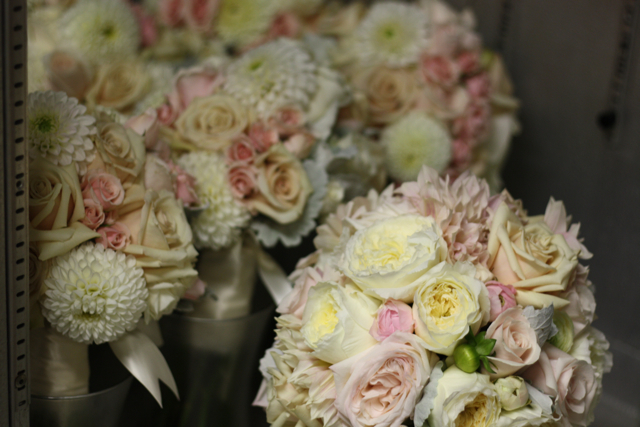 This bride’s bouquet features white cabbage roses, white and pink ranunculus, cafe au lait dahlias, pink ohara cabbage roses, white ohara cabbage roses, candy bianca roses, sahara roses and dusty miller. Slightly power packed and magnificent, if I do say so myself!!! 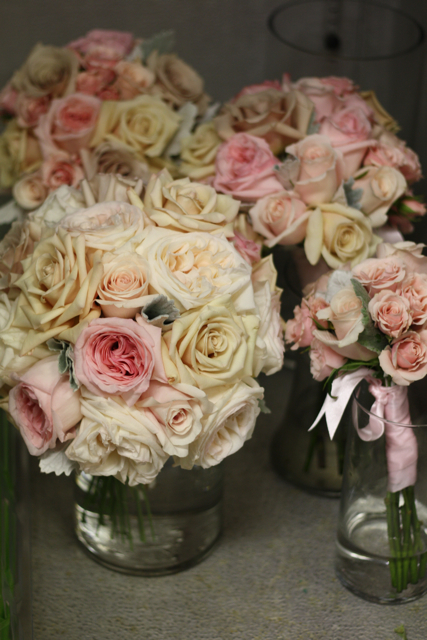 Look closely because this bridal bouquet belongs to a different bride. 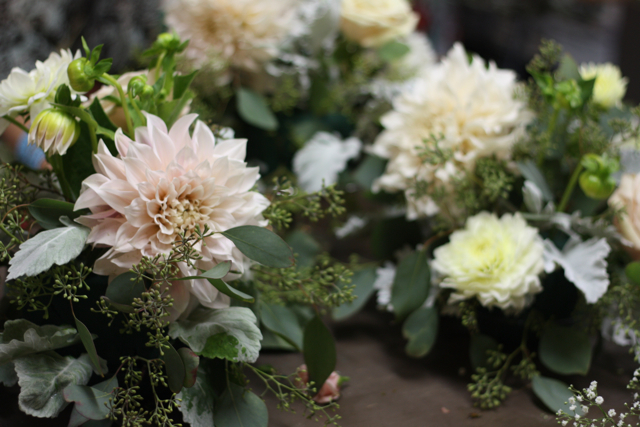 These bouquets are headed to Georgetown. 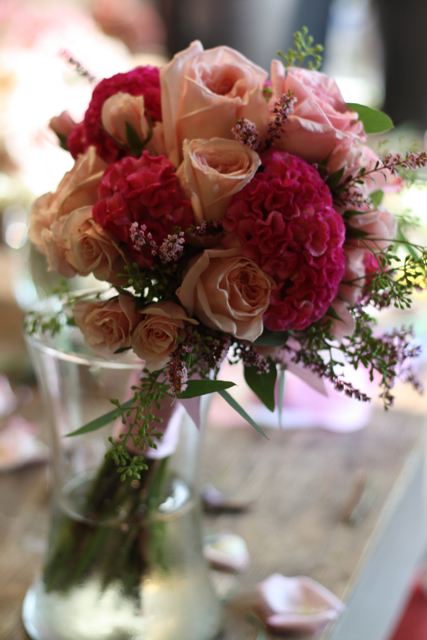 This bouquet is all about the roses and although the tones and some of the roses are the same, the look is quite different. I am also making a huge baby’s breath runner for this brides table. This is a design I have been dying to bring to life. Tomorrow’s the day!!! 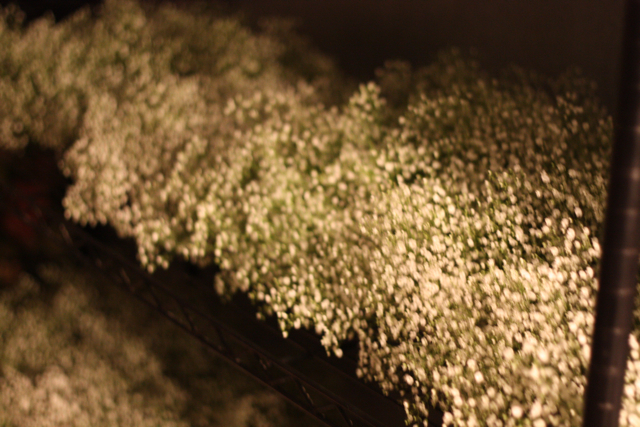 We created 14 huge rectangular trays of baby’s breath. The trays will be placed end to end on a long head table, this will create one solid baby’s breath table runner. 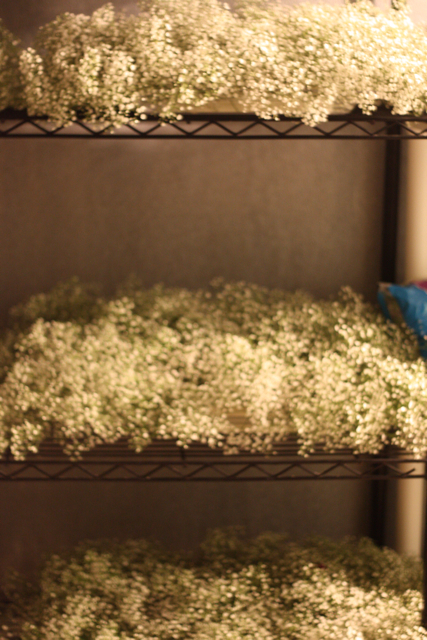 We will place glass cylinder vases and clusters of roses into the bed of baby’s breath. This is sure to be amazing. As you can see, we have so many beautiful things waiting in the cooler and this has been a very wonderful and exciting week for us. I certainly feel a lot better than I did a week ago. The blog is coming back little by little, with the help of family and friends. Evan, my husband, officially started as my partner this week and now life has become a lot less scary. We both will be able to run this business, get kids where they need to be, manage the needs of this family and this property (and trust me it’s a full time job times 10). We should be the poster family for the saying, “it takes a village.” Thanks to all of you that support and encourage our family and our business. 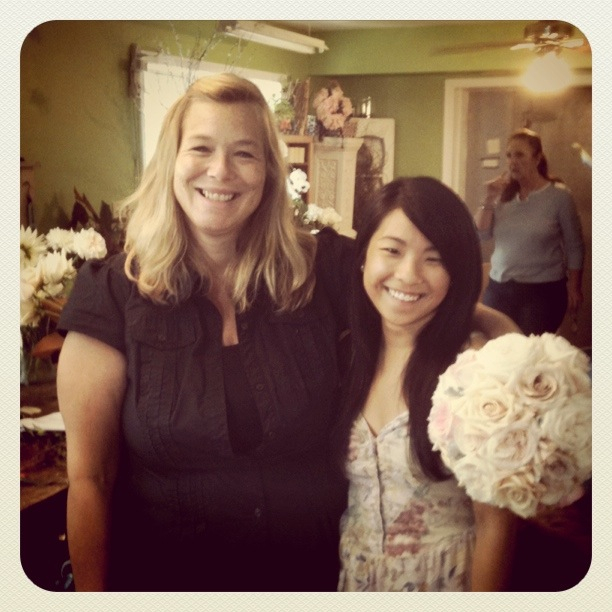 Here is one last shout out today to my new friend Megan Soh, who is a blogger and follower of The Full Bouquet Blog. Megan recently moved to DC from Texas and she is apparently a fan of our little blog. Megan is now working with my amazing friend, photographer, wedding planner, and stylist extraordinaire, Vicki Grafton, but I think I am going to have to scoop her up as well. This girl was adorable. Megan and Vicki put together a little photo shoot out in the yard with some of this weeks lovelies and I cant wait to see the images. Thanks also Megan for sending me these cute photo and now I know how to Instagram!!! 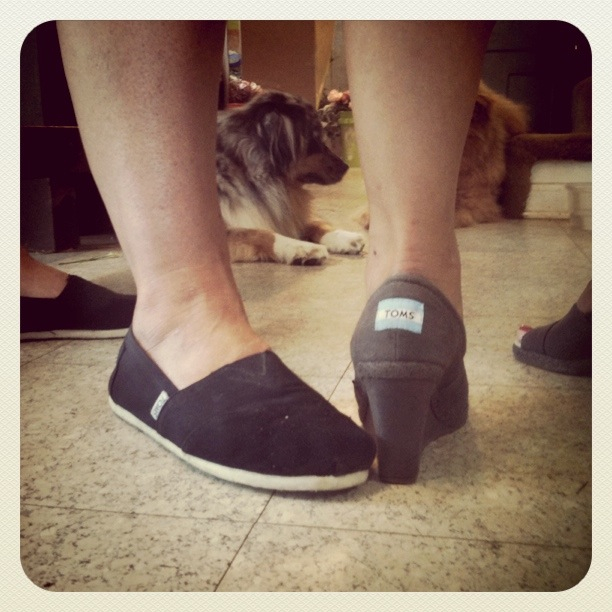 thanks for the shout out, holly! 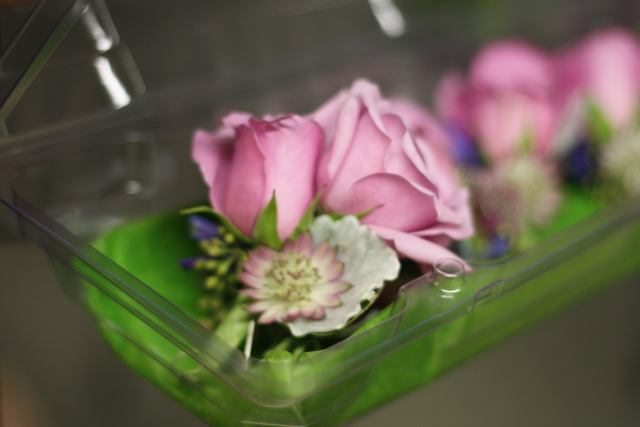 your arrangements are always so stunning, as are you – with or without prep (: i can’t wait to work with you more! LOVED, LOVED, LOVED my bouquet! 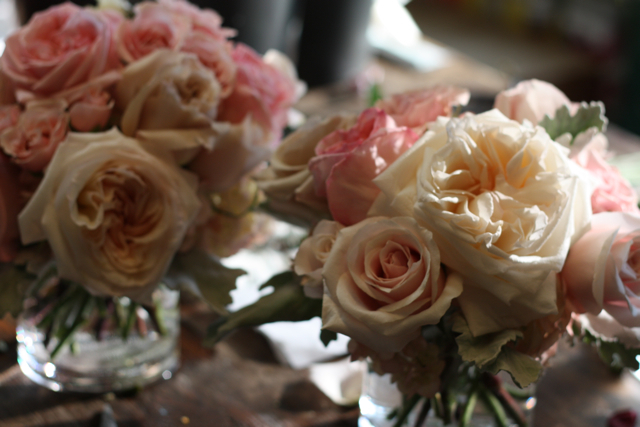 The cabbage roses still smell amazing. Thanks so much Holly!